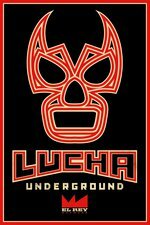 We probably don't need to have a post per episode, but the second season of LU has been crazy-good, and Aztec Warfare II was everything that wrestling can and should be and deserves to be talked about. This season has been great. Every episode I've thought "this is the best episode they've ever done". Obviously I loved Aztec Warfare, but I might like the Mil Muertes/Prince Puma/Pentagon Jr match from the week before a bit more. Now I have to go back & watch both episodes. One thing that I didn't even think about until some podcaster mentioned it -- are the backstage etc. vignettes ever seen by the audience in the Temple? The podcaster* was under the impression that the audience never saw them -- and of course, all of the in-ring action was done long before any episode aired, so if they didn't show them at the time, no one would ever know that, for instance, Joey Ryan is an undercover cop (lending a second layer of humor to his using handcuffs). * -- I think it was Marty DeRosa, but it might have been one of the Not Your Demographickers. My understanding is that we (the TV viewers) are the only people who know what happens during the vignettes. The live audiences & (more tellingly) the announcers don't know. That's why sometimes the announcers will seem confused about why something is happening when we have seen a backstage segment that explains someone's motivations or whatever. I just want to say that I was wondering about the conspicuous absence of the undercover cop plotline in Ultima Lucha Dos Part One, and it was definitely worth the wait. Holy bonkers. Six weeks until Season 3, which is back to 40 eps.